Over the past ten years CoachingOurselves has been working with L&D professionals to design and deploy successful peer group coaching programs for leadership and management development. Facilitated by one of the participants or by a certified facilitator. Using this basic model, CoachingOurselves has deployed hundreds of peer group coaching programs. Basic Design Model: Small groups and regular sessions are key to achieving organizational impact. Why use the “Classic” peer group coaching program from CoachingOurselves? We’ve found that this pattern tends to work well for organizations which articulate a need to develop individual leadership skills AND organizational aspects. The pain caused by the organizational challenges might be clear, but the issues can be messy and complex. Stakeholders talk about engagement or culture issues. Collaboration challenges or silos. Low trust or unclear accountability. Need for innovation or a desire for middle managers to take “ownership”. By reflecting together and sharing experiences, peer group coaching program builds highly productive communities of practice for leaders within the organization. Managers and leaders coach each other using the selected modules aligned with organizational needs (or pains). This enables the organization to deliver broad-based impact as it builds the capacity to develop itself. Organizations which use the “Classic” peer group coaching program appreciate using an internal manager as the session facilitator. This creates easy to set up, self-directed, effective peer coaching groups. This is increasingly popular as L&D team have far more opportunities to deploy innovative programs than they have in the past. The outcomes of a “Classic” peer group coaching program vary as much as the needs vary. The program tends to respond to the expressed as much as the unknown needs of the participants. We are giving leaders the opportunity to take a step back to reflect and dialogue with a small group of their peers, on a regular basis. And all, performed within their own organization. The overarching objective is to help one another improve their practice of management in order to increase organizational performance. 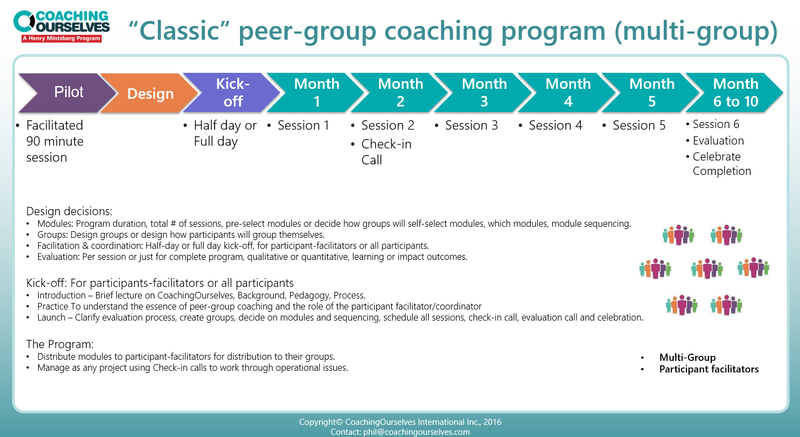 The peer group coaching program provides just enough structure and process, and is leveraged by the CoachingOurselves library of over 80 peer group coaching modules. Written by world-renowned authors these modules provide a wide range of leadership and management themes. The result is that leaders, eventually, figure it out. They figure out what is needed to improve organizational performance in their neck of the woods, at that specific moment. When organizations run enough groups through the process, over a sufficient period of time, we can use a simple form of multivariate analysis on pre-existing operational KPIs. With judicially selected control groups, we can statistically demonstrate significant financial or operational improvements. The messy and complex nature of managerial work means that traditional content-focused learning, either in a classroom or via eLearning, is ineffective at generating any real impact. Peer group coaching are one member of a family of new social learning approaches which fit well within the 70:20:10 learning model, which demonstrates real results. It will be an incredibly exciting next couple of years for peer group coaching, so get on board! Start by browsing our complete library of modules, and contact us today to get started on your peer group coaching program.